Opera Mini has some special commands that you enter in the address bar like a URL but without the “http://”. Many of them return information that’s probably only of interest to Opera’s developers but a couple are actually very useful. My favorite is config: which opens Opera Mini’s Power User Settings page where you can tweak many browser settings like the timeout and whether the browser should make phone numbers clickable. See my post Opera Mini’s Hidden Power User Menu for more information. 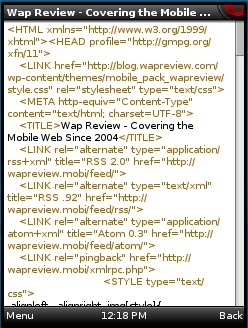 Web developers will appreciate server:source which displays the source code of the current page. Here’s a full list of all the hidden Opera Minicommands that I’ve discovered. I’ve tested these in Opera Mini 4.3 and 6 and I believe that (except as noted) they should work in all Opera Mini versions since 4.0.
debug: – Displays a page listing many Opera mini server and client properties. The “Host:” field tells you which Opera Mini server you are currently connected to. The first letter of the host is supposed to indicate which country the server is in. I believe that “r” hosts like “r02-12” are in the US. as I’m in the US and I’m usually connected to “r” hosts. I’ve also seen or heard of “t”, “z” and “v” hosts. Anyone seen others or know where any of them are? The following commands duplicate Opera Mini menu functions. I suspect that there are more of these hidden commands. If you’ve discovered others that are currently working, please lets all know in a comment. This entry was posted in Opera Mini Tips and Tricks and tagged Opera Mini by Dennis Bournique. Bookmark the permalink. ‘debug:console’ is very useful for js programmers as the errors and console.log’d values go here. Can you tell me how to mod operamini apk with host ? could you tell me how to set complex script in opera mobile browser. I know how to set it in opera mini browser but it is not there in opera mobile browser pls help. Using bitmap fonts for complex scripts is only supported by Opera Mini, not Opera Mobile. I cannot log on easily. Always it is ‘connection failed. What is the problem?. I don’t know what you are trying to log in. Opera Mini secret codes don’t require you to login. I wonder why they did this? Changing long standing pseudo-urls is not very user friendly. i am connected to this server. Am from india. …. When i try 4 facebook from opera mini ,it always shows an error message ‘ Remote server or file not found’. moreovere, i have been using facebook for 2 months with opera mini. Does Facebook work with UC Browser or the phone’s built in browser? If they don’t your operator or government might be blocking Facebook. Now i can not access to facebook from opera mini. Pls help me ,how can it be recovered? Facebook works for me in Opera Mini. What happens when you try?